I wish more things were clothes dryer friendly. They work great getting your sweat pants all nice and toasty on a winter’s day but not so good on electronic devices. My wife dropped my cell phone into the cat’s water dish and it never really worked the same after that. how did biff move the immovable object into the dryer? Duh, he took it and put it in the dryer. How else? See, that’s a little known fact about immovable objects… get them wet and they lose their immovable properties. Really? I gotta try that. I thought it was a simple matter of moving the immovable object, but maybe there’s more to it. Or less, I forget which. You know…it’s even worse when you drop it in a latrine. I still have to go to a store to have my old phone’s memory dumped into the new one. Well, I think everyone’s missed the really profound point here; there’s only One who can move the immovable.. I think our friend Biff here is more than he appears! Hmm.. interesting statement, if you look at him that way, heehee. Obviously he didn’t move the object to the dryer, but moved the dryer to the object. It just happened to be floating 2 feet above the floor by his specialized electrical outlet, by chance. Stupid question: What is the immoveable object? The “Immovable Object” is something that CANNOT be moved no matter what. The immoveable object doesn’t exist anymore. It and the unstoppable force cancelled each other out. Well, it seems to me that the drier is being forced to rotate, because it clearly cannot rotate the Immovable Object. Do not try to move the object. Instead only realize the truth. There is no immovable object. Then you will realize that it is not the object that is moving, it is yourself. Wouldn’t it just jam the machine? Unless it’s a very powerful dryer and the object has spokes radiating from its center. *GASP* its so obvious! Biff is The One! He was just letting Neo take over so he could stay home and blow stuff up. Blowing stuff up is fun. They do it all the time on the mythbusters. He used the unstoppable force to get the unmovable object into the dryer. Naturally. But objects stop when they reflected justbarely long enough for the force exerted upon the object they are reflecting off of to bounce back (If I understand it correctly). The humidifier and de-humidifier would just partially or wholly cancel eachother out, creating humidity settings not usually reachable by the normal machines. The real question: what would happen should a Katamari pick up the universe? So, if the immovable properties stop working when it gets wet, what if only half of the immovable object gets wet? Could you turn it in circles? Maybe the dry part would stay full power(the dry part is still in fact immovable) and the whole object would stay in the same spot, unless you broke off the now-movable part. OR, maybe one drop of water makes the entire object movable! I feel like slipping an Immovable Object™ into a friend’s car now. Also, do Biff’s eyebrows ever reach outside the borders of the comic? I couldn’t help noticing how they’ve conformed to the size of the panel. I’ll have to watch his eyebrows now. Man, it would be hilarious if he put that thing in his invisible car and tried to drive off. but no matter how he moved the object, the object is no longer immovable. My mom found a flat, dry mouse in the drier once. It had gone through not once, but twice for reasons I cannot remember. Her scream was priceless though. XD Normally mother is not an easy woman to phase. Ah, she also freaked out when she ran over one of our chickens and it exploded. HOW did it throw the dryer across the room? ok, don’t do that, unless you want to experience an explosion without a fire. But that does not hold true for everything. Light never stops, even when hitting a mirror (well, it stops if you freeze it, but that isn’t what we’re talking about). An unstoppable force would probably act the same way. Here’s another question for you: Can an unstoppable force be slowed down or sped up? Obviously, he used the portal gun to open a portal inside his dryer, then under the Immovable object. But immovable objects can’t be moved by gravity either (unless they’re wet, in which case they can be moved by anything, and Biff would probably just pick it up in that case). Oh! he BUILT the drier AROUND the immovable object! Of Course- top that logic! The opening to the dryer is a foot off the ground. Done. But, an Immovable object is affected only by gravity. That is how it gains it’s immovable properties. It has such a huge mass, yet such a low volume, that it’s personal gravity is so intense, it adheres permanently to any surface it comes into contact with. It’s a well known fact that if you leave an immovable object dry for a long enough period of time, it tends to sort of squish into the thing it has adhered to, eventually reaching the point where it breaks physics and destroys the universe. Physics have nothing on Biff! 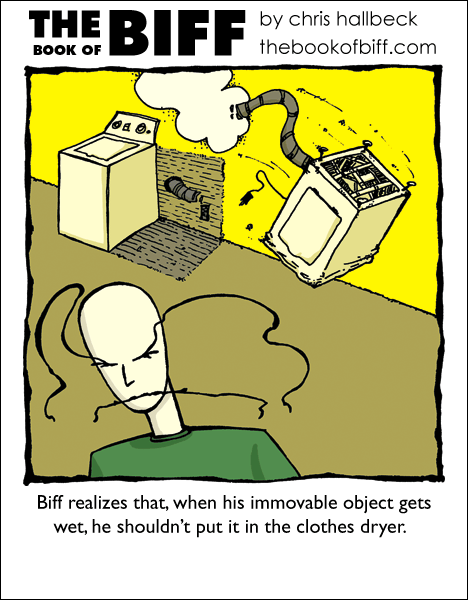 biff’s dryer is an unstoppable force. How come the dryer is spinning then, J? The unstoppable force and immoveable object are interesting but what I want to know is this, ‘what happens if someone that cannot miss aims a punch at someone that cannot be hit’? I know what it is! Its an immovable rod! DnD FTW! Poor Biff, he must have forgotten about the button when he put it in the dryer. MATRIX. See, they simply recoded the Matrix so the dryer is around the Immovable Object. 8D Biff had no need to do any heavy lifting. All very simple, really. “What if they didn’t know what chicken tasted like, so that’s why chicken tastes like…you know, everything!” Matrix = Epic Win. But if you think about it, the earth spins at many kilometers per second, goes around the sun at an even higher speed, and the sun goes around the galaxy, which is also traveling through space. So the object (and the dryer) should be on the other side of march by evening. He didn’t move the immovible object, he moved the univerce around it. He put the dryer around it. That still doesn’t answer why the dryer is halfway across the room. This is why. Absolute immovable objects are very expensive. Relative immovable objects (they are immovable relative to the greatest effective gravitational force) are cheaper. Biff had to pay his gravity bill that day, so he skimped on the immovable object. Interestingly, absolute immovable objects stay immovable when wer, while relative immovables do not. Biff, please tell me where you live so I can never go there.